Time has come to start talking about Vanilla 54, and some of its awesome new modules ! Vanilla Air AddIns for Excel allows you to connect to a Vanilla Air instance and run any kind of R programs from within the Excel interface. 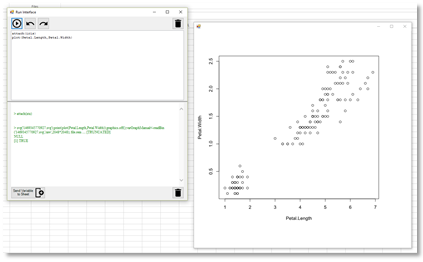 Vanilla Air AddIns for Excel provides a way for users to keep their Excel spreadsheet interface, build and run complex statistical programs from Excel, using R language. … stay connected for more, and start to imagine what we unlock !!! There is NO OTHER SOFTWARE available today that provides such level of power ! This week : Another new Tender for Bpm-Conseil, the company behind the Vanilla project … and this tender’s result changes a lot of things, as a validation of our strategy, as a proof we were right ! During the period mid-may & june, we got 3 tender’s results where we finished 2nd, sometimes for obvious reasons (tender was awarded before the process started, let’s be clear .. but its sometimes part of the game). Now we are back to the Winner Seat, with a crazy tender in “waste management” domain, including connected objects, mobile apps, data analysis and forecast module. Even better : with new tenders to be awarded soon in July, we definitly hope to be the awarded company & platform : we sized the team for this and we are ready to take new projects, even during summer time. As of today, compare to 2015, we already get a *15 (in amount of contracts for awarded tenders) … and still 5 months++ to go until the end of 2016 ! We built Platforms, and we – Bpm-Conseil and our partners – are using our Platforms to develop and deploy projects, BI projects, Analytics Projects, DataMining & Forecast projects … as opposed to pure editors which focused on building a brand and managing marketing campaign to increase brand recognation. Both approachs are valuable … as a customer & end user, what will be your choice when it comes to deploy for your users ? Summer will be hot … end of this year is going to be really fun, because side !